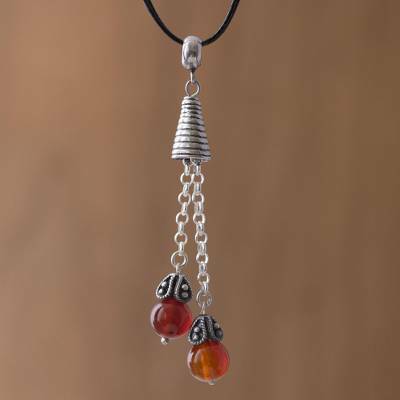 Agate and Silver Pendant Necklace on Cotton Cord from Peru, "Floral Pendulums"
Two pendulums of red-orange agate are caressed by floral petals, dangling from sterling silver chains in the pendant of this necklace from Peru. Marianela Vargas designs and crafts the creative accessory, centering the pendant on two lengths of cotton cord. You can find agate pendant necklace 'Floral Pendulums' by Marianela Vargas in jewelry categories such as Birthstone Necklaces, Agate Necklaces, Silver Necklaces, Sterling Silver Necklaces, Cotton Necklaces and Pendant Necklaces. Enjoy exploring these sections for other Novica treasures.